d = fdesign.polysrc(l,m) constructs a polynomial sample-rate converter filter designer D with an interpolation factor L and a decimation factor M. L defaults to 3. M defaults to 2. L and M can be arbitrary positive numbers. 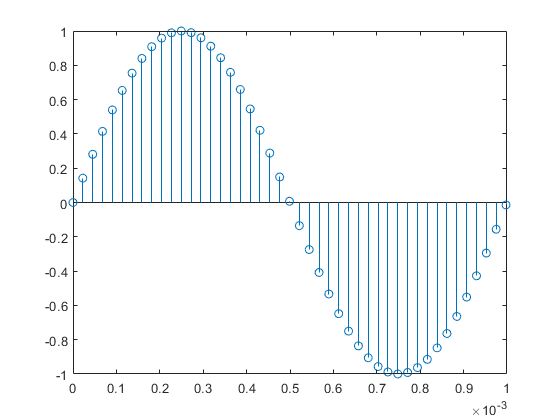 d = fdesign.polysrc(l,m,'Fractional Delay','Np',Np) initializes the filter designer specification with Np and sets the polynomial order to the value Np. If omitted Np defaults to 3.
d = fdesign.polysrc(...,Fs) specifies the sampling frequency (in Hz). 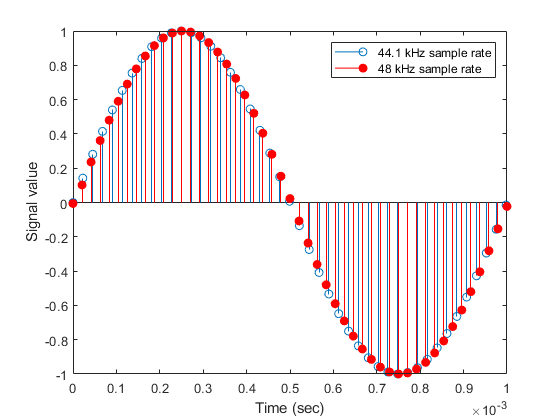 This example shows how to design sample-rate converter that uses a 3rd order Lagrange interpolation filter to convert from 44.1kHz to 48kHz. For more information about Farrow SRCs, see the "Efficient Sample Rate Conversion between Arbitrary Factors" example, efficientsrcdemo.